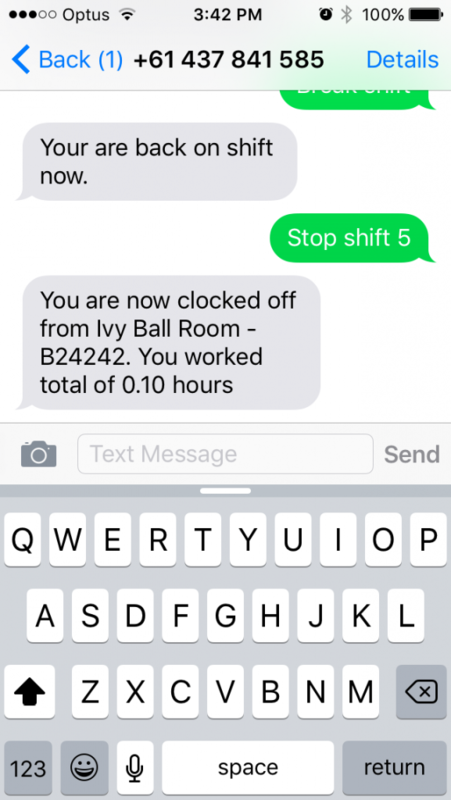 Clocking On/Off via SMS is one of the many ways of starting and ending your shift. To enable or disable this option, you will need to be a Location Manager or System Administrator. For your employees to work their shifts via SMS, they must have their phone number added to their profile. You will also have needed to publish their shifts to them via text messages so they may also respond via text messages. How Do I Enable SMS Clock On/Off For My Staff? To enable SMS clocking for staff, first, go to the Locations tab at the top of your screen. Next to each location, you will see "Edit Settings" displayed on the right. Please click it next to the location you'd like to enable the option for. If you have multiple locations to enable this for, please repeat the process. This will take you to the Location Settings. On the left, click "Timesheets". 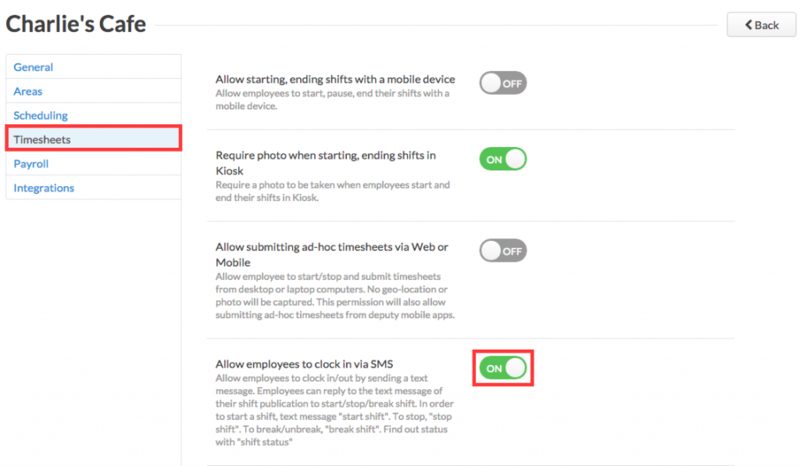 In the list of options, toggle on "Allow employees to clock in via SMS". After you have done so, click "Save" in the top right corner of your screen. How Do I Use SMS Clock On/Off? 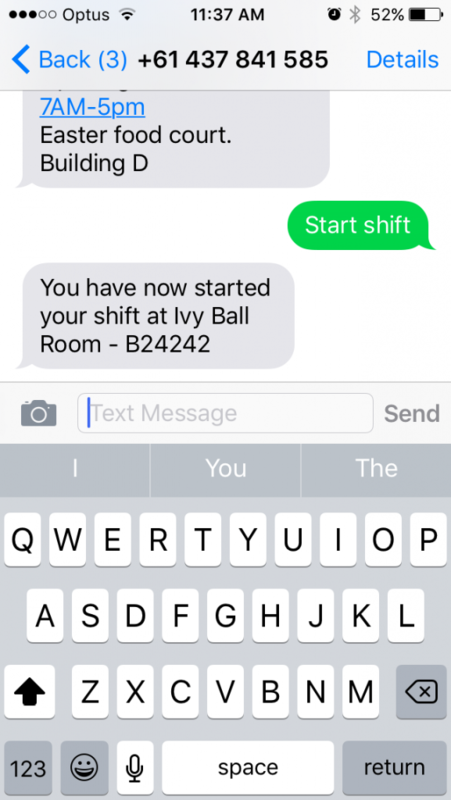 To start your shift with SMS, you will need to reply to the message sent to you with your shifts for the week. If the shift was scheduled, send "start shift". If it's an unscheduled shift, send "start shift name_of_department". To take a break, send "break shift". You can do this to start and end a break. You can do this as many times as you need to when on shift. Below, you can see the break was started and ended with "break shift". If you forget to take your break, you can add it when you end your shift (see below). To end your shift, send "stop shift". 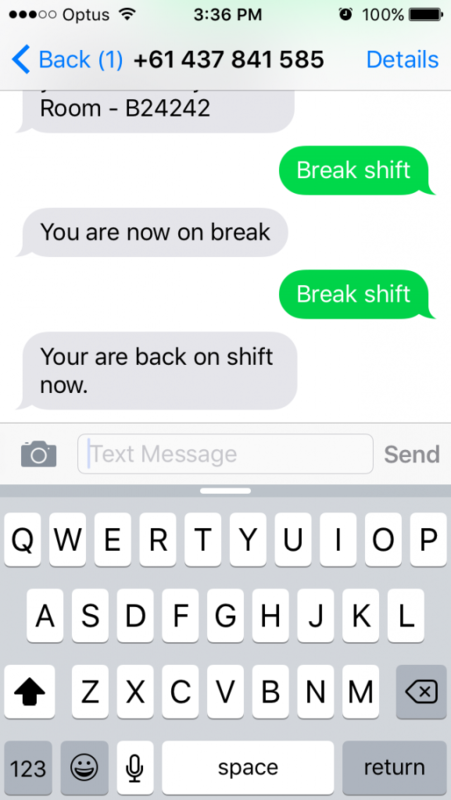 If you forgot to add your break, send "stop shift X". X is the number of minutes of break you took. "Stop shift 5" means you're stopping your shift and took a 5 minute break.